Fantastic potatoes! These potatoes are a perfect side dish for any meal. So easy to make and full of cheesy flavor. Mix thawed hash browns, 1/2 cup melted butter, salt, pepper, dried onion, sour cream, soup, and cheese. Put into buttered 9 X 13 pan. 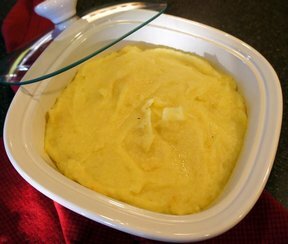 Mix crushed corn flakes with 1/4 cup melted butter and spread over top of the potato mixture. 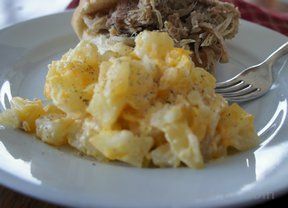 When these potatoes can cooked in a slow cooker the corn flake topping is eliminated but they are still great even without the topping. 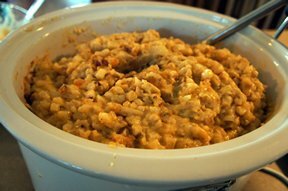 Place in a slow cooker and cook for an hour on high; then turn down to low and cook another 2 hours; or cook on low for 4 hours. Stir 2 or 3 times through cooking time. 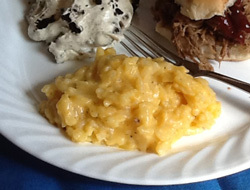 "We took these potatoes to a potluck and they were a big hit. Didn't even have a little bit to take home. You will love how easy they are to make. You just mix the ingredients and throw them in the crock pot and forget about them for a few hours. Great recipe!"